The United States Postal Service recently commissioned the renowned Gallup polling organization to perform a survey analysis of the USPS and its workers. While the Postal Service and its executive leaders certainly need to evaluate the Postal Service’s organizational dynamics and performance, it is not surprising that the report was not publicized. It was eventually obtained under a Freedom of Information Act request by the Inside Sources, an online media organization. Until these issues are addressed, there will be growing turmoil in the system and Postal Services workers will continue to the bear the strain of unrealistic targets, forced overtime and poor working conditions. It is no wonder that it has been relatively common for workplace violence to erupt at the Postal Service – hence the popularity of the phrase, “going postal.” My book explains this from my personal experience of 33 years at the Postal Service. Survey Says: No Recognition for Good Work; Supervisors Don’t Care for Workers as People; Don’t Feel Job Is Important; Fellow Employees Not Committed to Doing Quality Work. A survey of postal employees conducted last year for the United States Postal Service paints a dire picture of the state of the organization’s workforce. Gallup, which was paid $1.8 million by USPS to conduct the survey, presents a comparison to the results of similar surveys of millions of workers at hundreds of other companies in recent years. 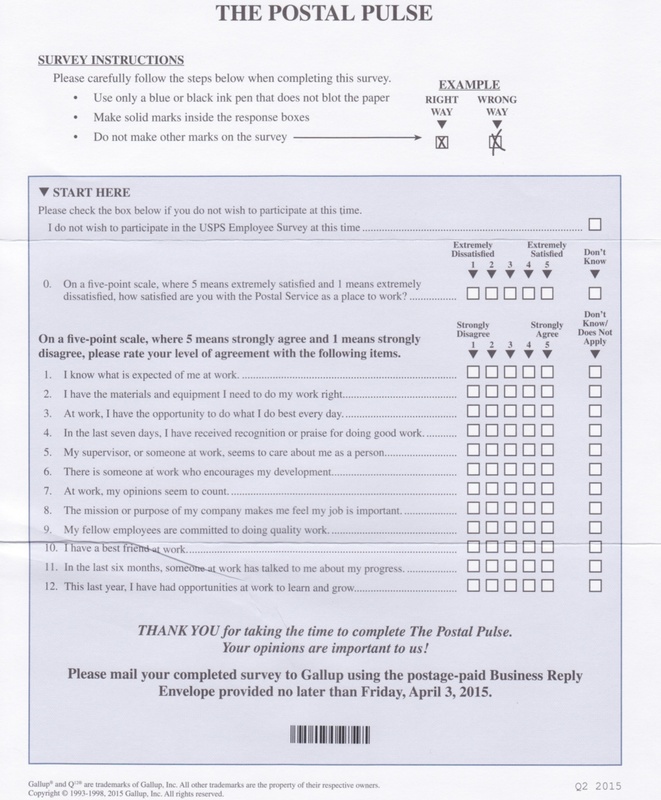 Across a range of questions addressing satisfaction in the workplace, the USPS scores in the 1st percentile, the very bottom, of the survey results. The topline results were obtained through a Freedom of Information Act request after the USPS declined to provide the data to InsideSources when asked in January. This was the first time the survey, known as Postal Pulse, was administered to postal employees. USPS previously surveyed employees on a quarterly rotation for 17 years. Postal Pulse is the first time Gallup has contracted with USPS to conduct a version of its Q12 survey, which since its development in the 1990s has been given to 25 million workers at over 1,100 firms worldwide. The percentile results provided to InsideSources are compared to Gallup’s 2015 Q12 Overall Company Level Database. While Gallup did not respond to a request to explain what data is included, past reports from Gallup suggest the 2015 database is comprised of data from 2012, 2013, and 2014, which would come from approximately 400 companies and 7.5 million workers. Noted as one of the “Strengths & Opportunities” found in the results is that 52 percent of employees strongly agree that they know what is expected of them. While this places USPS in only the 16th percentile of all the companies in Gallup’s database, this was by far the best USPS performed across all questions. The questions and the percentiles compared to the Gallup database are below. Q9. My fellow employees are committed to doing quality work. 1st Percentile. Q12. This last year, I have had opportunities at work to learn and grow. 1st Percentile. 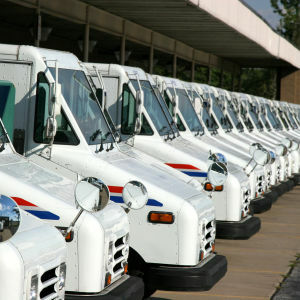 Gallup received responses from 270,000 postal employees nationwide. This was a response rate of only 47 percent, compared to Gallup’s 50th percentile response rate for other companies at 89 percent. The American Postal Workers Union discouraged its members from taking the survey because it believes the results could be used in contract negotiations. In a letter to InsideSources, Kelvin Williams, the Executive Director of Employee Engagement at USPS, explained that the Postal Pulse survey was launched in 2015 with the goal of improving employee engagement, which will in turn increase productivity, workplace safety, and value for customers. Williams said that USPS will be working to identify and correct problems identified in the survey. We are laser-focused on finding ways to make improvements in postal work teams — and their work environments — all across the country. We will hold postal leaders accountable for actively identifying and correcting their work environment issues in order to achieve a more satisfied and productive workforce, ultimately resulting in more satisfied customers. We are realistic, and we know this will take time, perhaps as much as four or five additional survey administrations.